The heroes are arranged by pick rate, and the data considers all games played in any region in the 5k+ (Divine) bracket. Note that we can’t filter data for 7.19 only, so the past 30 days are examined. Statistics from Dotabuff. According to the tradition, the popularity and performance of a hero in the competitive meta dictates the patch changes. But, Treant Protector has been neglected almost completely by pro players in June, and was a tier 3 hero in July with a 50% win rate. I believe IceFrog predicted a possible rise and based his actions mostly on the results at the Ancient and Divine rank. As an offlaner, Treant has a positive win rate at all ranks, but his pick rate is unsatisfactory until the highest brackets of the matchmaking, where people know how to exploit his strengths. Considering the large number of picks, a 56.6% win rate at 5k+ MMR is excessive. Treant Protector is a “recurrent” hero. Over time, thanks to direct or indirect changes, he turned into a super strong pick at high ranks, but his dominance only lasted for a few patches before fading due to series of nerfs. You might remember his popularity growth around 7.18, following the buff of the Meteor Hammer, which led to the successful Meme Hammer build. Stats. With a huge 762 health pool at level one, he can tolerate a lot of damage, especially versus casters. Instead, physical damage dealers might become a problem due to his poor 0.4 armor. In most cases, he has the upper hand as he can deal 87-95 auto-attack damage from level 1, and heal himself. Guaranteed Root. If you ever played against a competent Treant Protector, you may know the pain caused by his constant Root. Nature’s Guise makes him invisible when near a tree, and his first attack out of invisibility causes a disarming root. According to Dotabuff, the most popular build in the game (considering all ranks) prioritizes Nature’s Guise. At level 7, he has a fade delay of 3 seconds and a root duration of 2.2: a virtually permanent root which will definitely ruin the laning phase of many heroes. Maxing out Nature’s Guise is only one of the options as I believe Treant can level up any skill depending on the needs of the team. Let’s have a look at the other abilities while talking about the recent patch changes. Increased Living Armor health regen bonus from 4/7/10/13 to 4/8/12/16. Many players consider Living Armor the least useful skill, and they tend to invest only a point or two into it. In my opinion, the global heal combined with the damage block instances can have a huge impact on the game, particularly if there are many squishy heroes in your team that might be ganked during the early phases of the match. If the opponents don’t have DoT skills like poison, the effect of Living Armor is amazing. The buff in 7.16 is mostly oriented to the later levels, but it can also be of great help in the early/mid game if you prioritize this skill. One of Treant’s level 10 talents gives +2 Living Armor block instances, so you can heal a hero for 240 health points and simultaneously block up to 9 attacks. For example, this skill will ruin Faceless Void’s chances to get solo-kills with his Chronosphere during the early/mid game. Of course, prioritizing Living Armor in all your games isn’t a good idea because will weaken your own lane and gank chances. Consider it a situational option if your teammates do require it to stay alive: in a Dota game, particularly in pubs, preventing deaths can dramatically boost the morale of your team, and disrupt the gameplay of the enemy heroes who dedicate most of their time and resources to gank. Increased Leech Seed number of pulses from 6 to 7 (duration from 4.5 to 5.25). Increased Leech Seed mana cost from 80/95/110/125 to 100/110/120/130. Leech Seed is an absurdly strong ability in the lane phase, and honestly it requires a rescaling. It emits 7 pulses (+1 after 7.14, a buff that in my opinion wasn’t necessary) that damage the target and heal all the friendly units around. Once maxed out, it damages and heals for a total of 420 HP, but it goes up to 700 if you pick the level 20 talent +40 Leech Seed damage/heal. Considering the top 5 most popular builds on Dotabuff, the one that maxes out this spell has the highest win rate: 57%. The damage and movement slow caused by this ability, combined with Treant’s huge auto-attack damage, are a real pain to deal with for the opponent team. Also, your teammates in lane will enjoy the heal, which means you have a reliable way to keep them with full HP without needing Living Armor. 7.19 increased the mana cost, but this isn’t really a problem because Treant has a solid 315 mana pool at level one, and he doesn’t possess many skills to spam. Living Armor has only a 50 mana cost, and the cooldown is quite long if you don’t level up it. The build that maxes out Leech Seed is the best one in most games. You have a tool to secure the lane phase which is also extremely useful once the team groups up. With a low 7-seconds cooldown, you can spam it in battles and pushes (just target a nearby creep), keeping your team constantly healed. 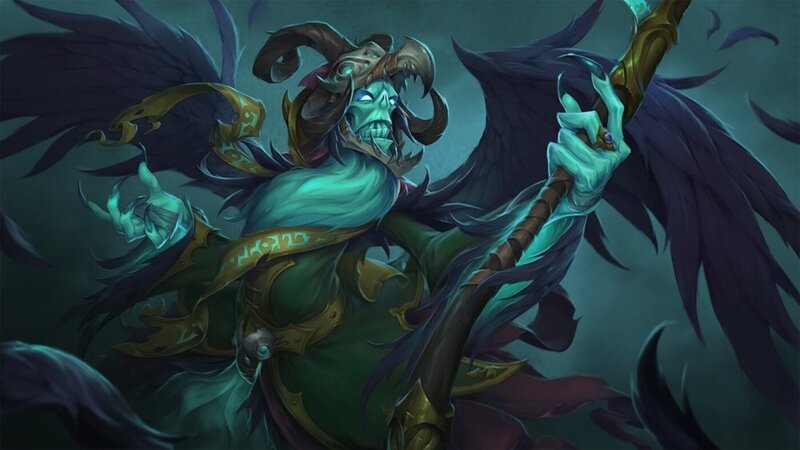 Skywrath Mage, Doom, Pangolier, Beastmaster, and Legion Commander dropped from the top 10, and have been replaced by Crystal Maiden, Necrophos, Treant Protector, Dark Willow, and Enchantress. 7.18 and 7.19 have a longer lifespan than the previous bi-weekly patches, and this factor deeply influenced the meta heroes. We will have a look at the changes in 7.19 that affected each hero in the new and old top 10. Level 15 right talent: Reduced Fire Spirits damage bonus from 60 to 50. A nerf to Phoenix’s mid game, but this change is 100% not sufficient to balance her. She is only a decent laner, but her popularity is caused by the massive impact she can have on the battle once reached the mid game. You must survive all dangers in the lane phase and level up as quickly as possible. The level 10 talent +90 gold/min introduced in 7.07 greatly helps her as there are many expensive items Phoenix can exploit to do her job. For example, the Shiva’s Guard is perfect in combination with Supernova as the active ability Arctic Blast slows the enemies for 4 seconds, preventing some escapes. Sun Ray can be a game-changer in teamfight as it heals your teammates and damages the opponents for a base amount plus a percentage of their health. Percentage based spells are scary in the late game: imagine healing or damaging a 7-8k HP Pudge! Fire Spirit’s damage per second has been buffed in 7.16. Thanks to the huge 140 attack speed slow, this spell is exceptional versus auto-attackers. You can keep multiple targets debuffed for up to 16 seconds as you have 4 spirits at your disposal, and each one has a 4 seconds debuff duration. This skill is incredible during all the game, and it became an even greater nuisance since the introduction of the level 20 talent Windrun grants invisibility. I believe a nerf is indispensable, and this one isn’t enough. The change is negligible at most ranks and it affects only the support Windranger. Players at very high brackets will notice the difference as they exploit this ability to harass the adversaries in lane, while low ranked ones mostly use it only as an escape tool. Spending more points into Windrun to decrease the cooldown isn’t worth it because all Winranger’s abilities are very valuable. The late game is unchanged. I featured Pudge, Crystal Maiden, and Enchantress in the Competitive Tier List of July, analyzing their strengths, place in the meta, and all the changes that affected them from 7.16 onwards. Check it out for the full explanations - below you can find a quick summary of the 7.19 nerfs. What makes Meat Hook so valuable is the 1,300 cast range at level one. We know that IceFrog rarely reverts changes, so he is trying to balance it by nerfing other components of the skill. 27 seconds is an eternally long cooldown, and Pudge might miss some gank opportunities after this adjustment, but the cooldown becomes acceptable after investing the second point. The hero doesn’t possess a big mana pool, and he requires time also to find a proper target to hook, so he can’t really spam the skill. It is still a nerf because now we are forced to spend two points into Meat Hook, while before one was enough, and we could give complete priority to Rot. A nerf to her early game, but it is basically not noticeable once you spend some points into the skill, and you want to max out Crystal Nova first because it is your best nuke. 130/170/210/260 AoE damage is reasonably strong in the lane phase, especially considering that nowadays you always fight versus two heroes in any lane - the movement speed debuff is perfect for harassing and ganking as it lasts for 4.5 seconds. It hurts your survivability during the laning phase because before you could spam this skill every 35 seconds, while now you must be more conservative due to mana issues. Spending more than two points into Nature's Attendants isn’t worth it because the healing effect doesn’t scale well, and you want to max out Untouchable when facing auto-attackers. Necrophos received lots of buffs recently that brought him back into the meta. He became a lane dominator able to trade hits against most heroes thanks to the combination of Ghost Shroud (immunity from auto-attacks and amplified restorative powers) and Death Pulse. The latter has been buffed in 7.16 increasing the mana regeneration per stack, and in 7.18 increasing the stacks duration and the damage of the spell. This first nerf in 7.19 is designed to make him weaker against certain picks as now he receives more magic damage while in Ghost Shroud. A nuker in the opponent lane might inhibit all his chances to use this skill in the lane phase and drastically weaken his survivability in the mid game. Killing enemies with Reaper’s Scythe brings a huge advantage to the team because their respawn time increases by 15/30/45 seconds. You can exploit it at all stages of the match to push a lane as the opponents (in numerical inferiority) will be forced to retreat. The ultimate has a 120 seconds cooldown, so the Aghanim’s Scepter was a mandatory pick to use this ability in every gank, and sometimes twice in teamfight thanks to the very low cooldown. Now, 40 seconds is acceptable, and still gives the hero plenty of reasons to upgrade his ultimate.